During the last decade, the technology of in-situ experimental safety evaluation of structures has been significantly improved and extensively tested. The research work presented here resulted in technical achievements concerning methods and equipment for loading tests. Furthermore, corresponding technical guidelines were formulated. By using state-of-the-art measuring equipment the research team could successfully evaluate the structural safety and serviceability of approximately 300 structures, among them about 30 bridges. The analysis of structures for a safety evaluation requires input data concerning the current properties of the structure and the mechanical boundary conditions. These preconditions can not always be met, especially not for existing structures. Possible reasons are an incomplete documentation, unknown effects of structural faults, and uncertainties in the modelling of the structural system with the appropriate boundary conditions. In such cases, additional data may be obtained by material testing and by measuring the exact structural geometry. If still the required proof of structural safety can not be given by analytical means, it is in certain cases worthwhile to determine the structural safety experimentally by performing an insitu loading test. This, however, has to be done without causing any damage which would impair the safety or the durability of the structure. A generally accepted procedure is the application of test loads to the structure and the simultaneous monitoring of the load-carrying behaviour, especially of deformations and microcrack formation. On the basis of the measurements taken, a critical load level can be identified, which is characterised by beginning damage processes. This critical load level must not be exceeded in the loading test. In order to avoid damage to the structure state-of-the-art loading and measuring devices as well as an experienced crew are required. The maximum test load level reached in the experiments is considered a limit load which taking into account a certain safety margin leads to the allowable service load for the corresponding structure, see Fig.1. Fig 1: Safety concept of loading tests. The application of the test loads has to be undertaken in a way that sudden failure of the structure is avoided even in the case of unexpected damage. During test loading, the behaviour of the structure has to be continuously monitored and evaluated in real time. In this way, critical load levels are identified and the loading program may be altered in order to avoid damage to the structure. By an experimental safety evaluation, very often additional resistance reserves are revealed which can not be shown by a structural analysis, especially in the case of concrete or masonry structures. This is caused by the characteristic properties of the non-metallic materials varying in a wide range as well as by the boundary conditions which are difficult to model for such structures. In numerous cases, the costly and time consuming replacement of structures could be avoided by experimentally proofing the structural safety. In addition, on the basis of the experimental results maintenance and restoration measures may be planned and undertaken in a more efficient way. A research team of the Bremen University of Applied Sciences, the Technical University Dresden, the Leipzig University of Applied Sciences (HTWKLeipzig) and the Bauhaus-University Weimar dealt with the experimental safety evaluation from 1992 through 2001 . Methods and equipment were significantly improved during this work. Furthermore, the team contributed into the formulation of a technical guideline for loading tests which has been issued in 2000 . The guideline contains the safety concept and technical rules for loading tests as well as criteria for critical load levels. According to the guideline, the experimental safety evaluation by loading tests should be limited to cases where analytical approaches appeared to be not applicable for proofing an acceptable safety level. Fig.1 shows the safety concept of loading tests. In the load-reaction curve, usually the experimental results reveal a higher stiffness of the structure as compared to the one obtained by structural analysis. Before the loading test, an experimental target load is calculated which simulates the design load level including live loads Qd and additional permanent loads Gd,j. Different safety factors may be used for the several load types following the concept of load and resistance factor design. A portion of the permanent loads GI is already acting before test loads are applied. These loads, mostly resulting from the self weight of the structure, need not to be simulated in the experiment. During the test, the load-carrying behaviour is monitored and the critical load level is identified which marks the beginning of irreversible damage processes. This load level extFlim is called experimental limit load. If it is lower than the experimental target load the experimental safety evaluation is considered to be unsuccessful. In the other case, the experimental limit load will not be reached in the experiment and sufficient structural safety is proved. Fig 2: Loading system for testing a concrete ceiling. Fig 3: Test loading of a concrete bridge by using reaction frames. As stated before, test loads have to be applied in a way that sudden failure is avoided in order to ensure the safety of the structure as well as the safety of test equipment and crew. Consequently, gravitational loads are not applicable in such experiments. Placing weights on a bending structure involves a considerable risk. If, however, hydraulic actuators are used and a steel frame serves for transferring the reaction forces to the supports of the bending structure, see Fig.2, the loading system is self-securing. In the case of unexpected damage the stiffness of the structure will decrease resulting in reduction of the test load. Fig.2 shows a reaction frame placed on a concrete ceiling. The frame is anchored near the supports and hydraulic jacks are acting between structure and reaction frame. A similar procedure for generating test loads has been used for bridges as well, see Fig.3. The construction of the required reaction frames is expensive and time consuming. Test loading by gravitational forces would be technically easier, but is not considered to be an acceptable alternative. For safety reasons the load level reached in this way should not exceed the service load. Consequently, by using gravitational loads only, an experimental safety evaluation following the concept presented in Fig.1 is impossible. For performing loading tests at road bridges in a more effective way, a special loading vehicle BELFA has been designed and built which allows to conduct these experiments without the cost and time consuming construction of reaction frames . The new loading vehicle BELFA is registered as a special vehicle and may be moved on public roads. Fig4 shows the BELFA in its transport mode. In the operation mode, the BELFA serves as a reaction frame, see Fig.5. For that, the vehicle is extended and lifted up by using four hydraulic supports, two in the front and two in the rear. The maximum distance between these supports amounts to 18m which limits the span of the bridges to be tested to this length. By lifting up the whole vehicle, its complete self-weight may be activated as reaction force for the test loads which are generated by up to five hydraulic actuators. Position and magnitude of the individual forces generated by the actuators are variable. In this way, different live load arrangements may be simulated according to the valid design codes. The maximum total test load amounts to 1500kN. Fig 4: Loading vehicle BELFA in transport mode. Fig 5: Loading vehicle BELFA in operation mode. Testing a one-span bridge will not last longer than about one day. This results in considerably shorter road closing times. The installation of the sensors for measuring the reactions of the structure requires additional time. However, the traffic flow on the bridge is not influenced by this work. At the rear of the vehicle, the control cabin is located, see Fig.5. In this cabin the measuring devices are installed and two engineers are controlling the experiment from there. The BELFA has a self-weight of about 700kN. If this load is not sufficient for compensating the test load applied, additional ballast weight is required. For that, an on-board water bag may be filled with up to 20t of water. If still the reaction force is too low, the BELFA may be anchored at the bridge supports by using high-strength steel bars. 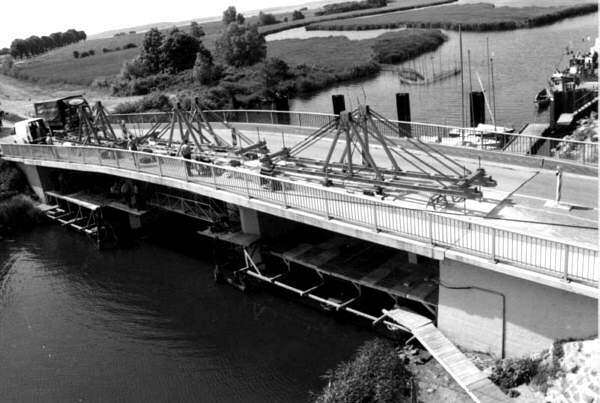 Since 2001 the BELFA has been successfully used for testing about 20 bridges . Fig.6 shows the BELFA on a historic two-span arched bridge in the German province of Saxony. This bridge was severely damaged during the flood catastrophe in August2002. After the flood, the bridge had to be completely closed for security reasons. The usage of the loading vehicle BELFA required a thorough preparation. A comparably brittle failure mode had to be considered for this structure. 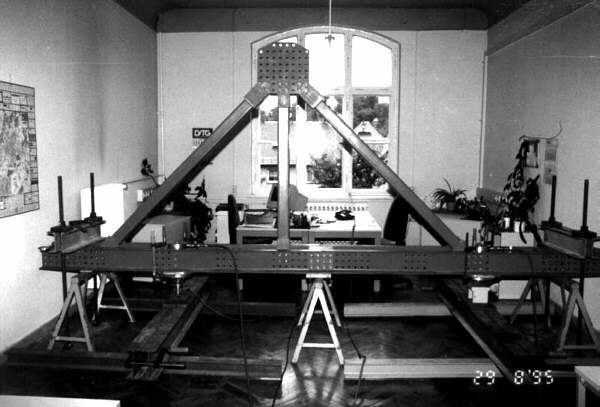 Before the actual test, by non-linear numerical analyses the effect of the three BELFA front axles standing on the bridges had to be estimated. It could be shown that under certain assumptions the structure withstands this loading. Nevertheless, the placement of the BELFA on the bridge as well as the loading test itself were carefully monitored by using numerous strain and displacement sensors. As an additional method for monitoring the structural behaviour under test loads the acoustic emission analysis has proved to provide valuable information . Especially in the case of concrete structures, this method allows a very sensitive crack detection as compared to deformation measurements. Taking into consideration the characteristic load-carrying behaviour of the tested structure, on the basis of the acoustic emission results conclusions concerning failure modes and locations can be drawn. 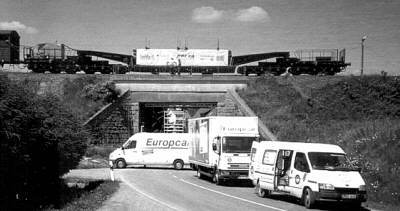 Experiences with the loading vehicle BELFA designed for testing road bridges led to the adoption of this technology for concrete and masonry railway bridges. A research team of the Hochschule Bremen and the HTWKLeipzig with the participation of the DeutscheBahnAG developed a prototype of a railway loading vehicle BELFA-DB for testing bridge structures . 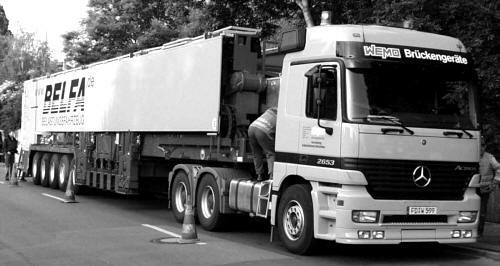 Fig 7: Loading vehicle BELFA-DB. The BELFA-DB consists of a standard railway wagon loaded with steel plates, see Fig.7. Because of its twelve axles a moderate axle load of about 21t allows to move the vehicle to the test site on normal tracks. If necessary, the transport weight of the wagon may be reduced by unloading it. 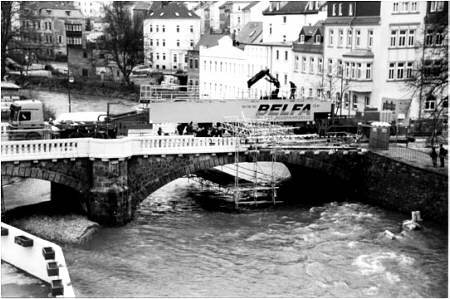 As in the case of the BELFA for road bridges, the self-weight of the vehicle acts as a counter-force for the test loads. The latter are applied by 8 hydraulic jacks, four at each side of the track, see Fig.8. In order to prevent damage to the rails steel girders are used for distributing the loads. Since the bending stiffness of the wagon's main girder is too low for the purpose of transferring the reaction forces, the ballast steel plates are used for strengthening the cross section. For that reason, the plates had to be tight together by using steel bars. The BELFA-DB prototype currently used is applicable up to a bridge span of approximately 15m. This range includes about 80% of all concrete and masonry bridges. The design of a new loading vehicle for a considerably larger maximum span would probably not be efficient. Fig 8: Hydraulic jacks attached to the loading vehicle BELFA-DB. Fig 9: Loading vehicle BELFA-DB on a railway bridge. Usually, the test load is acting on four simulated axles, see Fig.8, having a distance of 1.6m according to the standard railroad load set UIC71. The total maximum load which may be generated by using the current prototype amounts to 1800kN. A planned new loading vehicle should allow to apply test loads up to 2800kN in order to reach the experimental target load for most of the bridges within the concerning range of spans. 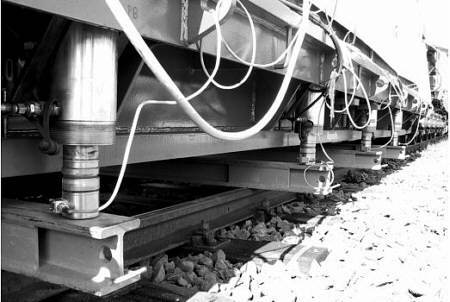 Since 2001, the BELFA-DB prototype has been used for testing 10 railway bridges . All these projects were considered to be successful. Fig.9 shows the vehicle in operation on a bridge in Germany. For some of the bridges, a hybrid approach combining numerical simulations and loading tests was used for the system identification and safety evaluation. As far as the measurement of structural reactions due to test loads is concerned, for the railway bridges the same methods and sensors as in the case of road bridges may be used. However, investigating the dynamic response of the structures appears to be more important for the railway bridges. The experimental safety evaluation of structures appears to be a technical alternative if analytical approaches fail to prove sufficient structural safety. Especially in the case of concrete and masonry structures, by loading tests numerous structures could be saved from demolition and financial as well as environmental resources for their replacement could be saved. During the last decade, the technology of insitu structural testing has made significant progress. Results of this development are special mobile loading devices for road and railway bridges. Their usage allows to conduct loading tests more efficiently. The applicability of the new equipment has been proved by successfully testing several bridge structures. The financial support of the research projects by the Bundesministerium für Bildung und Forschung and by the Deutsche Bahn AG is gratefully acknowledged. K.Steffens, Experimentelle Tragsicherheitsbewertung von Bauwerken, Ernst&Sohn Berlin 2002. K. Steffens, H. Opitz, J. Quade, P. Schwesinger, Das Belastungsfahrzeug BELFA für die experimentelle Tragsicherheitsbewertung von Massivbrücken und Abwasserkanälen, Bautechnik 78(2001) 6, 391-397. V.Slowik, RolfSommer, MarcGutermann, Experimentelle Tragsicherheitsbewertung von Straßenbrücken mit Hilfe des Belastungsfahrzeuges BELFA, Beton- und Stahlbetonbau 97(2002) 10, 544-549. G.Kapphahn, Schallemissionsanalyse (SEA) bei experimentellen Tragwerksuntersuchungen, Fachtagung Bauwerksdiagnose 1999, München, DGZfP-Berichtsband 66-CD. G.Kapphahn, N.Leister, Schallemissionsuntersuchungen zum Tragverhalten schlanker Stahlbetonbalken, Fachtagung Bauwerksdiagnose 2001, Leipzig, DGZfP-Berichtsband 76-CD. H.-U. Knaack, C. Schröder, V. Slowik, K. Steffens, Belastungsversuche an Eisenbahnbrücken mit dem Belastungsfahrzeug BELFA-DB, Bautechnik 80(2003) 1, 1-8.